One of my weaknesses is auctions. I love the hunt, the competition and the thrill of finding something rare and special. When I was living in Indiana there were lots of estate auctions every weekend. I would check the website AuctionZip to see what was coming up and see if there was anything that piqued my interest. I went to an auction that had several children’s books listed, the description said first editions. Upon inspection they weren’t firsts, but I stuck around to see what deals I might get. About one hour into the action, the auctioneer held up a large blue book that looked pretty beat up. He said it was an old book of home plans. I started bidding at $5.00, and kept going until it got to $25.00. It just didn’t seem like that great an item. I shook my head no, but the auctioneer opened the book for me and showed me some pages. I don’t know why but the book suddenly appealed to me. I got up to $40.00 and everyone else bowed out, then one of the regulars who like to steal items at the last minute jumped in. He kept bidding, to ‘run me up’ as they say, but, again, I my Spidey Sense was going so I hung in there. I got the book for $90.oo. I put the book in a box with the rest of my junk and went home. 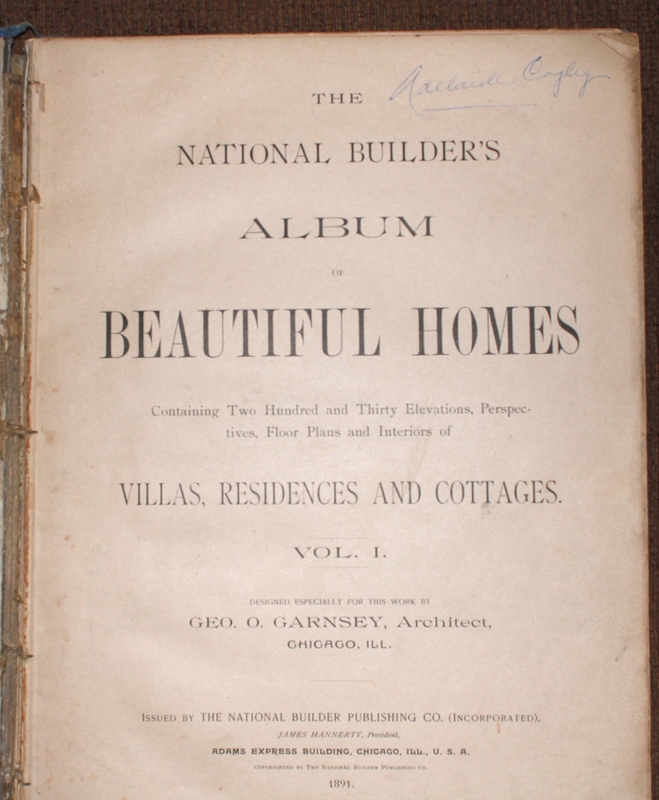 The book is the National Builder’s Album of Beautiful Homes by George Garnsey, published in 1891. I didn’t hold out a lot of hope for it, the book had been in a chicken coop, and it was pretty much covered in bird poo…pages were loose, there was dirt at the edges and the poor thing was just about ready to go in the trash heap, but the illustrations are cool and so I pressed on in my research. style homes and helped rebuild Chicago after the fire in 1871. He also wrote a book on architectural terminology. That was great, this guy was real, he had credentials and had written other things. It will be easy to get more information on my book! A year went by, and not so much as a peek at the title online. Was this just a junky title that had no interest or value to collectors? Then one day I typed the title into a search on AbeBooks and there it was, The Album of Beautiful Homes, 1891. It turns out this title is extremely rare, only 25 copies known to exist. The seller had his copy listed at $1800.00, obviously in much better shape than mine. So now I know that the book is worth preserving and protecting. So here we are, with a barn find book that is worth quite a bit of money, and more importantly it is a great pieces or American architectural history. So here is where the new adventure begins. I am going to restore this book to a readable condition, so that it is safe for the coming generations. I will be updating as progress is made with photos and stories about the challenges I meet. Follow along and feel free to yell at me if you think I am doing something wrong. It’s not just an adventure, it’s a job! This entry was posted in Antiquarian Books and Ephemera, Book Binding and tagged Antiquarian, Architecture, Book Arts, Bookbinding, Books, Floor Plans, Garnsey, History, Queen Anne, Rare Books, Restoration, Victorian. Bookmark the permalink.